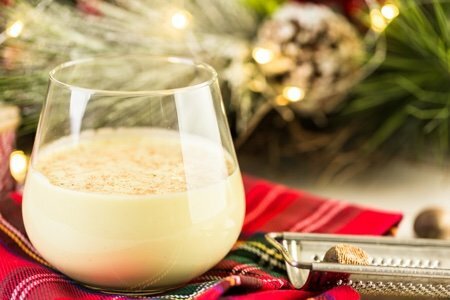 A healthy eggnog recipe? Can it be done? I don't know if I would call this recipe "healthy"- but I would call it a massive improvement over the original recipe and anything you can buy in the store. The problem starts when you ask me, "Snack Girl - make eggnog into a zero calorie treat!" - my reaction is BLECH. There are recipes for eggnog that feature egg substitute, stevia, almond milk and non-fat milk - and I just can't go there. 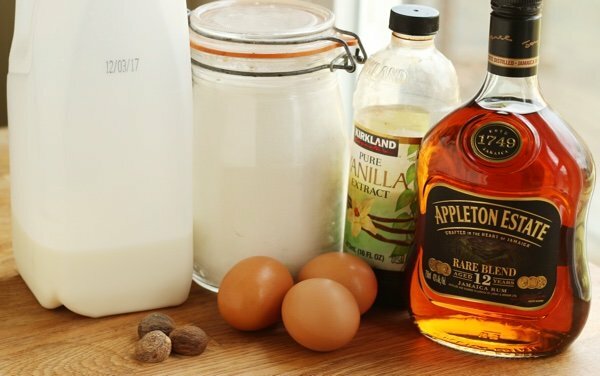 How can you get a concoction with that combo that touches the real ingredients of eggnog - milk and/or cream, sugar, eggs, and liquor (with a little nutmeg). It is not supposed to be healthy - is is supposed to be DREAMY. But, I do HATE the corn syrup, additive filled, containers of eggnog that grace our supermarket dairy section. They are packed with calories and they taste, well, fake. Check out my DIY Peppermint Mocha and how to make an iced mocha at home for other drink recipes that use real ingredients. You have to make your own eggnog to get the TRUE flavor of eggnog. After trying homemade eggnog, you will never buy a container of eggnog again. Now, I use raw egg in my eggnog. For those of you with a deep fear of salmonella, this is not for you. I know the source of my eggs (a family farm in my region) and they have never had an outbreak of salmonella so I am keeping my fingers crossed. Below my raw version is a cooked version for the risk averse. Where can you cut calories? portion control - stick to 4-6 ounces and savor them! use lowfat milk - not as DREAMY but still tastes good. make it once or twice for the holiday season and share with friends. Since I am WAY over 21, I like rum in my eggnog. Bourbon, brandy, and scotch are also good additions. I've seen eggnog served in a martini glass - which I think is a great idea to help you SIP it. 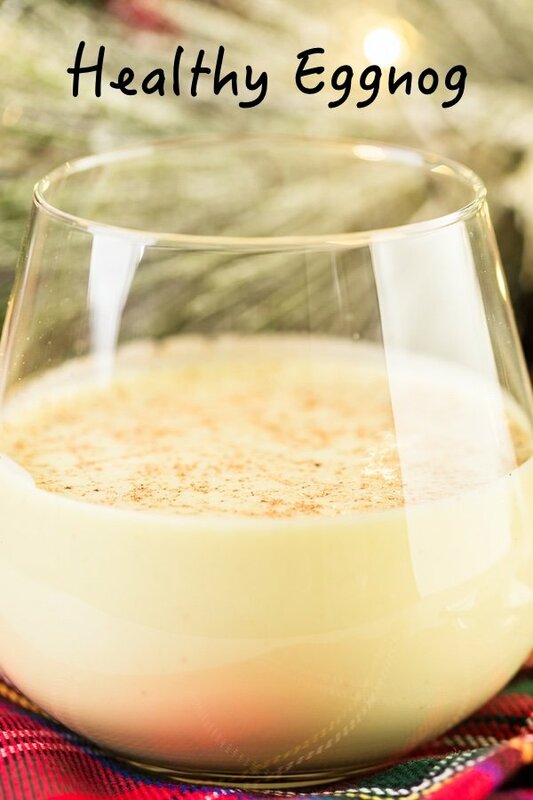 Have you made homemade eggnog? Separate the eggs and beat the yolks with the sugar. Stir in vanilla, milk, and rum. Beat the egg whites and fold them into the milk mixture. Pour eggnog into a SMALL glass and top with nutmeg. ENJOY! Separate the eggs and beat the yolks with the sugar in a medium bowl. Reserve egg whites for another use. In a medium saucepan over high heat, mix milk, sugar, and vanilla. Bring to a just to a boil and remove from heat. Mix the hot liquid gradually into the egg and sugar to prevent the egg from cooking. You add small amounts and mix thoroughly until all of the hot milk is mixed in. Pour everything back into the pot and heat until it reaches 160 F. Remove from heat, add rum, and put in the refrigerator to chill. When eggnog is cold, top with grated nutmeg and serve. I've always "cut" my egg nog... 1/2 egg nog, 1/2 milk... since I was a little girl. Another way to slice some calories. I take Silk eggnog, So Delicious unsweetened vanilla coconut milk (50 calories a cup but really rich since most of the calories are fat--but it's the good saturated fat, those MCTs that don't get stored, they get burned) and a 1/2 shot of liquor and shake them in a blender bottle with some ice. Then I put a little whipped cream on top. Yum. Yes! Silk Eggnog is the best. I don't really add anything to it cause it tastes pretty good as is. Adding alcohol ups the sugar, yikes. I still swear by Hungry Girl's No-Nonsense Nog made with unsweetened vanilla almond milk. One whole cup for 2 Freestyle points! Make sure you use a blender and put in fridge a couple hours (to thicken slightly). I make up a large batch and bring it in to my Weight Watchers group around this time every year. It is always a big hit! Thanks for all the great suggestions! I will try Silk Eggnog and Hungry Girl's recipe as well as cutting mine with milk. The recipe says you cook the yolk, but not the egg whites, you add the egg whites raw?? How is it safe to use raw egg whites but not raw yolks? Confused..
@Karen - good point. You don't need the egg whites so I will change the recipe. Sorry about that! How long will this keep in the refrigerator? I’d like to make it a few days ahead if possible. Thanks. @Katina - It depends on your milk. If your milk has plenty of time before it goes bad - it should stay good until that date. Great question!! Use UHT milk and it will stay good for much longer. I have used it for many things including making yogurt. It is shelf safe before you open it and then refrigerate it after. You can add guar gum if you want it thicker. Also, you can cook your egg mixture until it becomes thick, just until it becomes pudding, then thin it if needs be with more milk and blend. My favorite, buy the vanilla pudding, the kind than needs cooking, in the package from the store, cook it and drink it hot. Better than eggnog. You can use nonfat milk or Silk to cook it with too. Re: raw eggs for the nog - I spoke with someone at Egg Beaters to ask if I could use their pasteurized product uncooked in my homemade Caesar Salad and was assured I could, so for those who wish to stay away from raw store bought eggs, this would work. For Marlene: Believe it or not, not all eggs have salmonella. If you are concerned, however, eggs can be coddled and if you are using only yolks (which I recommend) they can be cooked as in making pudding which is basically what the eggnog is. BTW, egg whites are severely lacking in vitamins and minerals. Whites have zero vitamins but do have 1/2 the protein of a whole egg. I eat 2 or 3 whole eggs everyday and never have a problem. My labs are perfect. Cholesterol is primarily an inherited problem and not specifically due to diet. Google Harvard studies on this. To what point are the egg whites to be beaten? For cooked eggnog method sugar is mentioned twice but only 1 amount in recipe. Can you please confirm that only 2 tablespoons of sugar is needed and when to add it. Thanks.